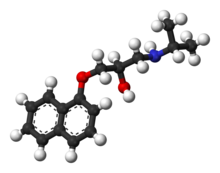 Propranolol is a type of medication known as a beta-blocker developed in the 1950s. Beta-blockers were originally designed to protect the heart following cardiac surgery. The side effects of beta-blockers can include a reducation of anxiety and some interesting effects on traumatic memory. Beta-blockers have been used for some time as an approach to reduce anxiety and more recently they have been used experimentally to reduce the effects of trauma. The diagram to the right shows the chemical structure of propranolol. Current research seems to suggest that the when traumatic memories are accessed when taking propranolol the intensity of the memory reduces. The reduction seems to be permanent and the effect only seems to apply to traumatic memories. This has been referred to as the "Memory Dampening Effect". In cases of trauma propranolol can be used within the therapy room reasonably effectively because propranolol has "relatively" few side effects. Propranolol combined with EMDR / hypnotherapy tends to generate the most rapid and "pain-free" trauma resolution possible for those that experience the memory side-effects of propranolol. In other words, if propranolol reduces anxiety for you, propranolol plus therapy will reduce your anxiety even further. You would need to be prescribed propranolol by your GP and should take the medication as directed for as long as you are undertaking therapy. Typically this will be approx 1 to 5 weeks. The propranalol dose is taken approx 30 mins before each session so the treatment coincides with the time when the propranolol is at its highest concentrations. The medication remains active for about 4-5 hours (half-life). To proceed you must first contact your GP to determine if you are suitable for propranalol (there are contraindications that preclude the use of propranalol). Thereafter therapy can be scheduled to help you target the traumatic memories and recode them as rapidly and painlesly as is feasible. In the case of this practice this will include EMDR and hypnotherapy as primary interventions. Click here to view video clip from a recent BBC Horizon program that mentioned the use of betablockers in the treatment of trauma. Click here to download a video clip from a recent BBC Horizon program that mentioned the use of betablockers in the treatment of trauma. (Exe format 6 MB). Also featured on "Mindshock: Transplating Memories"